The species has been recorded from a number of sites on the south coast between Sandwich Bay, East Kent and Chesil Beach, Dorset. It was recently discovered in South Wales (Alexander & Morgan 1994). It is fairly widespread in Europe, and also found in the U.S.A.
P. fasciata is found mainly on sand dunes and sometimes in other dry coastal habitats such as shingle. In South Wales the spider was found on steep rocky limestone sea cliffs, on bare and sparsely vegetated limestone slopes and in a very warm and dry spot with loose rocks and sparse, herb-rich limestone grassland vegetation on skeletal soils (Alexander & Morgan 1994) Adults of both sexes are found between April and July, females also in September. For some sites, the records are over fifty years old. 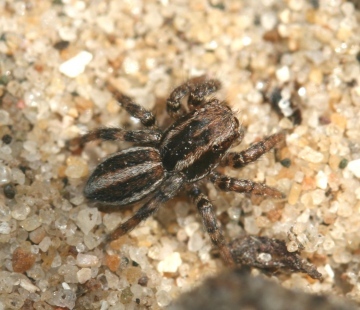 The spider was recorded in small numbers at several sampling points at Rye Harbour and Dungeness during an NCC survey in the late 1980s, but it is not common. Several specimens were found independently at two locations on the Gower in 1994 and it may be widespread on limestone cliffs in that area. Erosion caused by high public use, particularly the use of motor vehicles on shingle, and possibly holiday development threaten the rather fragile habitats of this species. Dungeness has been extensively damaged by gravel extraction, which has causing significant alteration of the hydrology, and thereby ecology, in addition to the obvious loss of shingle area to gravel-pits. There are plans for a new power station at Dungeness. Ensure that important shingle beaches and sand dune sites are protected from damage due to gravel extraction and to excessive use of off-road vehicles.